It’s Judgment Day at Betsson Casino with the arrival of the brand new Terminator 2 video slot. This game boasts all ingredients for another massive hit. Benefit from exciting features, while the bonus games increases your chances of winning. It goes without saying that the Terminator 2 game is based on the 1991 American science fiction movie. Hasta la vista, baby! On the reels appear all the main characters of the film, in addition to scatter and wild symbols. Other symbols, like diamonds, hears and spades, also fill the reels of this 243 ways slot. 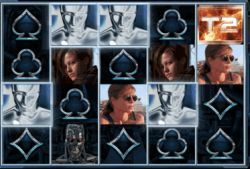 Enjoy fun clips from the exciting movie after landing a winning combination. Slots players love free spins, and those are up for grabs while spinning the reels of the Terminator 2 slot. Collect so-called ‘time travel orb scatters’ to benefit from free spins, which are rather distinguish. You will play those free games on a 1.024 ways to win format, increasing your chances of landing many winning combinations. Besides free spins, bonus features are also appealing to online slots fans. While playing this new game the T-800 vision can appear. This exclusive vision will analyze the symbols in order to boost your winnings. On top of this, the T-1000 symbol will randomly transform into other symbols to increase your payouts. Betsson Casino offers a an impressive online gambling repertoire. Players can choose from a wealth of exciting video slots, including South Park, Hall of Gods, Starburst, the Dark Knight, etc. There are also many table games available, such as roulette, blackjack, baccarat and poker. Betsson Casino’s gambling inventory also features fun games, including bingo, Vault Assault, Star Ticket, Bonus Keno, Football Cup, etc.